Maybe this is the one to cause enough damage. Apparently it was. Since then, there has been a little crack every time I bend my knee while sitting, shifting gears, etc. So about two weeks ago I was at my doctor and he was looking at my tennis elbow (yeah fencing injury #2). I told him about the cracking and he wanted to look into it. So we did a compression Xray (weight bearing). When we got back in and looked at it, he says, I’ve got good news and bad news. The good news is that you still have room behind your knee cap (and points), and the bad news is that your kneecap is slowly collapsing (compares the gap to the xray from 4 years ago), and its 50–75% smaller. 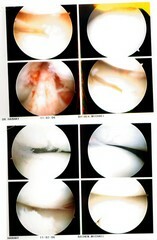 He recommends surgery to repair the torn meniscus. I tell him that the biggest fencing event of the year is coming up in January, and since it’s been 4 years already, could it wait until then. Nope, he wants to get me in ASAP, so that happened to be yesterday. 6:45am to be precise. So we had to get up at 5am, get the kids ready, packed etc and make the hour drive down to the surgery center. Dr. Harhay’s a good surgeon and worth the effort though. 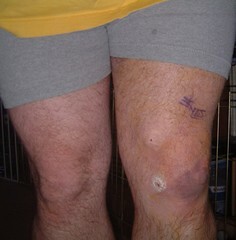 Here’s my wonderful knee post-op. The surgery went fairly well as I understand it. Unfortunately, because of stupid HIPA laws, he has to talk to the patient and not someone else. I mean, wtf? I just got our of surgery and you’re trying to talk to me about your findings, recovery rules, etc, and I can bearly keep my eyes open let alone remember anything. I would have gladly signed something so that the Doctor could talk to my wife instead. Nope. I’ll get the full story when I follow-up with him in 2 weeks. Here’s what I do know.. I didn’t come out of recovery too well. They called my wife to pick me up and said “He’d be ready in 20 minutes”. Well it was 45 minutes after she got there. I was very naseuous and they had to keep giving me medicine. I also kept falling back asleep. It was just that side of ‘please let me throw up and I’ll feel better I promise’, for almost the entire time.. not fun at all. I slept the whole way home. Then I got in, laid on the couch and proclaimed “I’m feeling a little better, maybe I’ll stay u…” Seriously. I was asleep again in less than a minute. Most of the afternoon I was sleeping and waking in like 20 minute spurts. I finally managed to stay awake from about 5pm to 10p. Overnight was strange. I woke up here and there, once staying awake around 5am and watching some TV. Drugs do really weird things to you. On that note, let me say ‘Yeah Oxycodone’. Knowing how powerful the stuff is, I’m trying to avoid it unless I really need it, and take Tylenol instead. I needed some today when my *muttering* dog decided to leap onto it. I’m supposed to start my exercises today, so I’m sure I’ll need some after that too. If all goes well, I’m supposed to have 80% mobility in 3 days.. we’ll see if it’s true or not. I’m supposed to be back to work on Monday, but now 36 hours later, when the surgery medication is finally starting to wear completely off, I’m starting to realize what actual pain I’m in. I;m going to try and keep it elavated – which is real difficult trying to get your knee above your head for extended periods of time. Alrighty, that’s my update. Who knows, as the 01doc021102332 (that’s Doctor, typed by a 15 month old, btw), said, I should be no worse off in January for K&Q then I would have been without the s354urge4ry0, maybe even better. Problem will just be that I won’t have the 8 weeks leading50 up to it for practicing. Of course, I’m worried that this is going to be career ending. The doctor and I are going to talk about that later. Originally he felt fairly confident that it wouldn’t be, but with this additional damage, I don’t know how that will affect things. You’ll know how it’s going to go at the 2 weeks follow up discussion? You’re right to be wary of the Oxy – not only does it relieve the pain, it gives you quite the buzz. Take it easy, heal, and don’t worry about K&Q. It will still be there in 2008! Dude, I’m sure you’ll heal up fine. Good luck and get well very soon. take care of yourself. Oxy-whatsis sounds eee-eee-eeevil to me, but fun (kind of like percoset), don’t get too fond of it. Thanks for the thoughts folks.. more updates recently..
Next → Next post: [Personal] It’s leprechaun stomping time!